Garden lighting kits started to become popular when fittings made from plastic, or other inexpensive materials, began to make garden lighting much more affordable for homeowners. They started as weather-proof boxes with transformers inside of them which also included tungsten lamps. Of course they were consisted of thicker lower voltage cabling which allowed them to extend farther out into the garden. However, nowadays tungsten lamps are starting to be replaced by more efficient halogen reflector lamps. Halogen lamps are incandescent lamps that have a small amount of halogen such as iodine or bromine added. The combination of the halogen gas and the tungsten filament produces a chemical reaction which gives evaporated tungsten back onto the filament that increases its life. 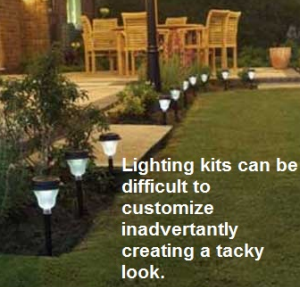 Most retailers that sell garden lighting kits are very limited in their selection. The light fittings usually are made from plastic for easy assembly and reduced cost. They make contact with the conducting wires by sharp contacts with the ribbed cable that pierce the insulation. The low voltage cable connects effortlessly to the transformer, which is primarily designed for indoor use. Installing these systems generally does not require a permit. Most states require a permit for installing any voltage systems over 10 volts and all garden lighting systems have voltage lower than that. There are many drawbacks to the lighting kits, one disadvantage to garden lighting kits is the quality of the material from which the lights are made, usually modulated plastic. Most of these plastics change shapes when around high heat temperatures so the lamps used tend to be low power. The low power limits their usefulness in large gardens and only makes them effective in small garden features. On the other hand, they are a means of safe lighting in trenches or underground places where very low voltage is needed. They do not have a warranty on them due to the cheap cost. They can cost anywhere from fifty to two hundred dollars per kit depending on the type. Most kits are not customizable. Homeowners who invest in garden lighting expect an experienced designer to make their garden unique. 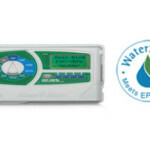 Our installers have access to top name manufacturers that sell only to authorized distributors. Kits are a helpful way for homeowners to experiment in lighting. This may later lead to interest in using higher-power metal products for larger features or areas in the garden. In addition, it is important to see in what environment the transformer is suitable for. For example, if the transformer is fitting for exterior use and that is where you wish to locate it; then that is the type of transformer you should budget. Garden lighting kits are easy to use and a can be a good way to experiment with what type of lighting you want in your garden. Before investing in a temporary solution, please give us a call at 770-943-9654 and ask about our free demos.